Peg making is one of the oldest gypsy crafts, although like many traditional crafts it has all but disappeared in the face of mass production. This gypsy peg was bought in the 1930s from A. & M. Cuttings store in Front Street, Mendlesham at a price of 2d a dozen. A gypsy would call at the store to ask Mr Cutting whether he needed any clothes pegs, and he would often order a gross (12 dozen or 144). The gypsy would then make these over the next two or three days, and return with them, often being paid in goods rather than cash. The pegs would be delivered and sold as a dozen pushed onto a sliver of wood. The pegs were made from a length of willow or hazelwood which was cut to the right length and then had a V-shaped notch cut in the base end. 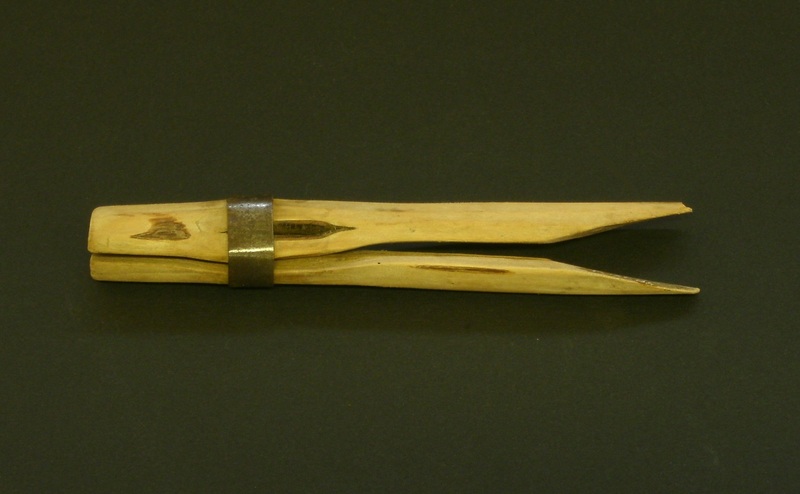 The band of tin, cut from an old can, was then nailed into position at the top of the peg. The peg was then split with a sharp knife from the point of the V-notch to the tin band. The pegs were then pegged onto a rope, usually in front of the wagon, to dry out and allow the slit to set into its open shape.